It's safe to say that this last break has proven to be a longer hiatus than I had anticipated but when life happens, well... it just happens, doesn't it? But I'm back with passion and ready to nail down a great blog schedule packed full of engaging content for you all. My first stop was Simply Be, who have some amazing reductions in their ongoing sale. And ok, ok, ok.... I bought ONE pretty dress BUT in fairness I don't own a red dress and since the red dress effect was recently proven, I figured now was as good a time as any, especially considering the price I managed to get it for! I have had my eye on the Jameela Jamil Midi Dress for a while but at £60 it was out of my budget, when it came down to £24? And I had a discount code... let's just say it was fate! If you think this red dress looks gorgeous on the site, you will be blown away in reality because it feels luxurious and more sumptuous than even I could have imagined. It's true to size and because the fabric is quite thick it ensures a beautiful hang to the material. This is a dress that appears to be durable as well, definitely a staple to have on call should an occasion occur. A second piece I'd had my eye on for a while was the Pale Pink PJ Blouse which came in at a decent £24 to begin with but honestly? I wouldn't wear it as an actual top. I did lust after it for loungewear purposes though so I kept a close eye, hoping it would come down a little in the Simply Be Sale and boy did it!!! It has come right down to a very purse friendly £7.75! I've been wearing it for the last couple of evenings and it's light and silky feeling enough to be perfect for Spring yet it works well over lounge T shirts as an extra layer of warmth during the colder nights. I'm pretty delighted with this pick. I recommend buying a size or two up as there isn't any stretch in the material so if, like me, you had wanted a really nice loose, soft flowing blouse style then you will need to go up a little. Remember, sizing is just a number so don't be afraid to order sizes up, I have dresses in a size 14 and tops in a 20, it means absolutely nothing other than I buy for comfort AND style. My final pick from Simply Be wasn't actually in the sale but it was a good price. I'm not a huge jeans fan and I'm still learning which trousers best suit me and feel comfortable, so I absolutely love a good maxi skirt. One of the most versatile pieces of clothing someone can have in their wardrobe. Easily dressed up or styled casually, one staple piece can prove to be money well spent and in this case the Simply Be Jersey Maxi Skirt, coming in at £20, seemed a bargain considering the wear I know I will get out of it. Keeping the black maxi skirt in mind... I then hit the Littlewoods Sale and picked up some ridiculously great bargains. Granted it was freezing cold when I placed my order, which might explain the abundance of jumper type tops but I live in Northern Ireland where the temperature is never really hot and I tend to run cold a lot of the time so really I was shopping smart. Yes, I'd love to be looking forward to Spring but in reality, I'm freezing a lot of the time so jumpers will get worn, A LOT! 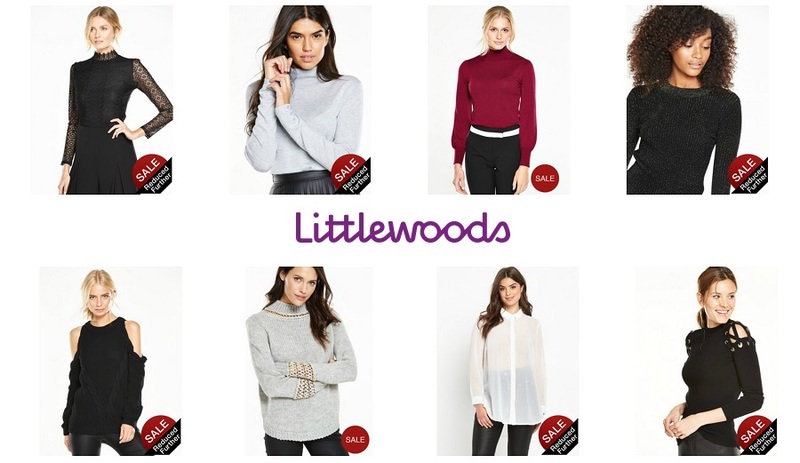 I hit the Littlewoods Sale over a weekend when they were running further reductions (which they seem to be doing again so it's a great time to go bargain hunting) and, as I'd mentioned before, I shopped with specific intent. I had wanted some light jumper style tops, a flowy white blouse style top (wardrobe staple!) and I had wanted one dress top (just in case!). I wasn't disappointed. I'll take you through each piece I ordered and my subsequent thoughts on it but would advise being quick if you fancy any of them because at these prices I doubt they'll be around much longer! The first item in my basket was the V by Very High Neck Lace Top which was £30 and is now sitting at £7.20 (no, that's not a typo!). This is a great piece to have to call on, even just to pair with the maxi skirt above or a midi skirt you already have. It is lined through the body with material that has great stretch and the lace effect is beautiful, there's something modern gothic yet victorian about the design and the high neck lends itself to an extra level of elegance. Next was a plain V by Very Roll Neck Jumper that I had to order in the grey because the black was no longer available but it was reduced to £10.60 and I know I'll get the wear out of it throughout the year. 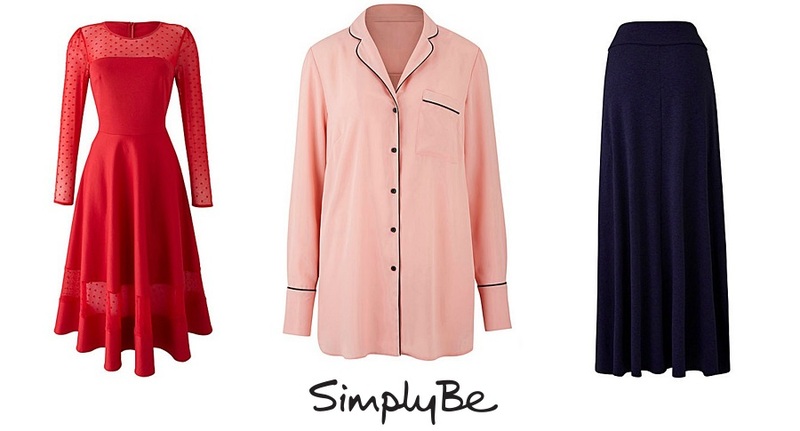 This might look plain but it has beautiful button detailing on the cuffs and is exceedingly soft. I've shown it in the red version here but the next item, the V by Very Blouson Sleeve Roll Neck, I actually also ordered in grey (I'm trying to wean gradually off all black everything). Hold onto your seats because this beaut is reduced right down to £4.50 at the moment and if there is one thing I can tell you about current and upcoming trends, it's that statement sleeves are set to continue to be a thing and blouson sleeves are just fabulous! Here's the thing concerning the sparkly jumper top... I don't have much sparkle left in my wardrobe and it IS just after Christmas so when I spotted the V by Very Metallic Stripe Jumper reduced to £15.60 my inner magpie had added it to the basket before my consciousness caught up. No regrets though as I absolutely adore it! Initially I had wanted to order the black version of the V by Very Cold Shoulder Braided Cable Knit Jumper but alas, when I looked I was only able to order the ivory so I took a chance and I'm glad I did. This was originally priced at £40 but had come down to a very reasonable £16 and considering the detailing that you just don't appreciate until you see it, I believe it to be a solid bargain. The cable knit detailing is a gorgeous addition to what is usually a fairly boring cold shoulder option and I'm slowly becoming a cold shoulder convert - yeah, I didn't see that coming either! This jumper is gorgeously sumptuous and really nicely warming. Perfect for the changeable weather. If I'm being completely honest, the next item, the V by Very Chain Trim Jumper, is the only item I wasn't as fussed on when it arrived. The chain detailing is a lot heavier than I had thought it would be and it's COLD! To me that kind of defeats the purpose of a jumper, when you slide into a jumper you're aching for cosy warmth and this jumper offers cold chain against your skin but at a budget friendly £10.50 in the sale, it's hardly worth the effort returning. It'll be worn, just maybe not as much as the other items I ordered. One item I'd been on the look out for this long time was a staple flowing white shirt and when I happened upon the So Fabulous Diamonte Sheer Shirt I took a huge chance and I'm so glad I did. Usually I'd see diamonte and run the other way but the sparkle in this shirt is so subtle it only serves to add to the overall femininity of the shirt. The flow on this item is perfect, I ordered two sizes up for extra drape and it's perfect plus at just £10 it was a steal considering it's a fact that everyone needs a white shirt in their wardrobe. The very last item I ordered, with the very last of my Christmas gift money was another cold shoulder jumper. I know! I told you I'm being converted. The V By Very Ribbed Jumper with Cut Out Eyelet Detailing is such a clever twist on a cold shoulder and there's something beautifully grungy about it I just had to have it. Out of all the pieces I ordered this will probably get the most wear, to the point I dare say I'll wear it out entirely! Currently reduced to just £12 as well! These were my first V by Very items and I have to say I'm incredibly impressed with the quality and the standard of fit. Each piece feels durable and true to size so if you want it to fit close to your body, order your actual size, if you like something a little slouchy then order a size up but all in all I didn't have to return anything because of ill fit which is really quite impressive! Definitely a brand I'll be keeping a closer eye on in future. With the discount code in play and using money I was gifted at Christmas, I managed to shop smart in the sales and came away with all of the above for under £100 all in which I'm delighted about. There's a lot of mixing and matching that can be done with my buys when taking into consideration the other basics I have in my wardrobe and the best bit? I'll be so toasty warm! If you're after any of the pieces I've shown here today, do be quick as they'll not be around at those prices for long and I'm all about taking advantage of the best bargains and if you'd like a closer look at how these items wear, keep an eye on my Instagram and my snapchat (seraemily). Shop smart and enjoy the sales!